"My sister makes this delicious appetizer for many of our parties and family get togethers. They may be made ahead of time and warmed up on a pizza tray just before serving. Serve with tomato sauce for dipping." Cook tortellini according to package directions. Rinse under cool water, and allow to cool slightly. In a large resealable plastic bag, combine bread crumbs, cornflake crumbs, salt, pepper, and parsley. Heat oil in a deep fryer or deep skillet over medium heat. In small batches, dip the tortellini in egg, and place in resealable bag. Shake to coat, and set aside on a plate until the oil is hot. 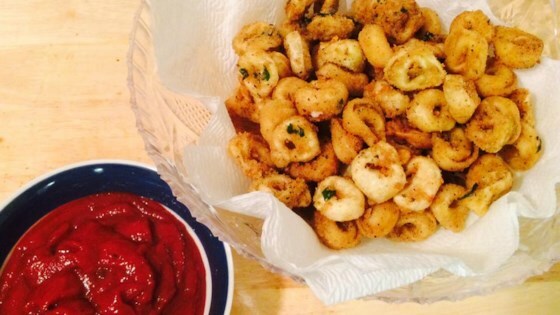 In batches, deep fry breaded tortellini until golden brown. Serve with tomato sauce for dipping. I feel that I have to rate this recipe because one persons bad review has brough the rating down. This is a simple and delicious recipe. It is best if you use unflavoured breadcrumbs. Very good. I made these for a party and they were a big hit. Great apps recipe. I used seasoned bread crumbs and added a little grated cheese and salt and pepper to it. Made a tomato sauce, alfredo sauce and a pesto to dip in. This was great!I cooked it for a party I was going to and everyone told me how they loved it, if I were a teacher I would give it an A++! You rock Andrea!